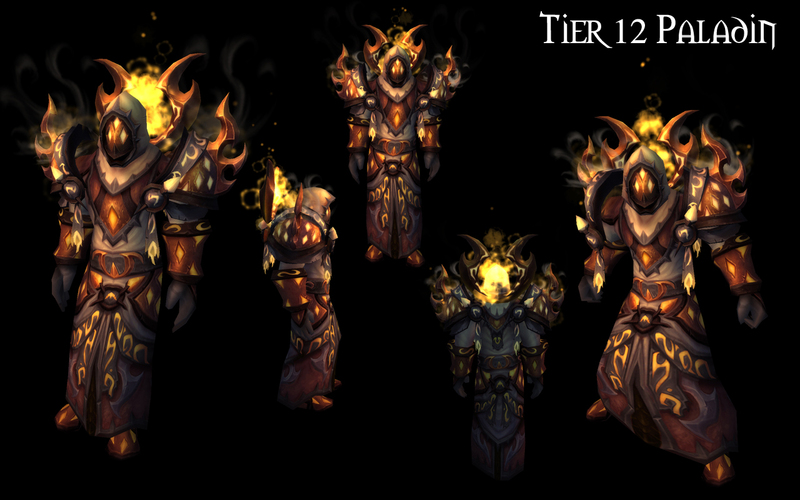 Tier 12 Preview – Plate Dress Anyone? I am going to refrain from using the following article to further advance my Crusade for an appearance tab. However, I have some fundamental issues with the this next batch of gear – not new issues mind you – many of these issues have lingered since about Tier 5 or earlier depending upon your class of choice, but issues nonetheless. I would also like to caveat this article with a few “for the record” statements. 1. Generally Speaking: Why do nearly all the tiers including this newest round look like they are part of an official uniform? The issue is that each piece looks like the same EXACT artwork/pattern that is then copied and wrapped around the character model. This leaves really no distinction among the gloves and boots for example, they are basically carbon copies with only the smallest change in pattern and leave a very unnatural look. There are no solid color pieces and no diversity from piece to piece. 2. Specifically: As a Paladin, I hope and pray against the obvious that this is a mix up. How in Hades can this art, in any way, depict a Paladin? In fact upon looking at the this Paladin T12 preview, I could never guess that this is gear for a Paladin. Priest? Warlock? Mage? Sure, but Paladin? Make no mistake, the armor is actually visually stunning (accounting for my first complaint) but how this represents a Paladin is beyond me. Don’t Paladins get made fun enough of already? Now we get to tank in a dress… how does a plate dress work anyway? Mage, Priest... wait that's a Paladin? This entry was posted on May 3, 2011 at 10:26 pm and is filed under General, MMO, Role Playing, World of Warcraft. You can follow any responses to this entry through the RSS 2.0 feed. You can leave a response, or trackback from your own site. Not to defend Blizzard’s awful designs, but that “dress” isn’t a dress, it’s a long surcoat, worn presumably over plate armor. Actual armored skirts are common in Warhammer’s High Elves, as scaled coats. As for fighting in a “dress”, I direct you to Japanese hakama, and Scottish kilt.